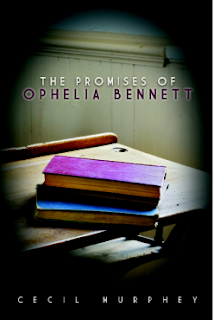 Ophelia Bennett was assigned to a school notorious for running off teachers. But, she doesn't assume that the children are unmanageable. She deals with them as human beings with gifts and talents that she intends to develop. Set in 1940 in Illinois, before my time, the story reminds me how different education is today. Back then, lessons were very structured, and they were not meant to be pleasant. They were chores to be endured. Bennett sought to make the children want to learn. She made it fun, and she also pointed the children toward their natural talents. And she prayed for them. The parents and school board thought their children were not getting a proper education. After all, learning was not supposed to be fun. The story begins and ends with Bennett's class members' class reunion years later. We get to see how Bennett's teaching affected their lives. It's a wonderful, heartwarming story with a few humorous moments. I think it would be a great gift for a teacher. Cecil Murphey is a well-known writer of nonfiction. Although he does have a few fiction titles, it's not what he's known for. I hope that he will write more stories like this. Disclaimer: I received a review copy of this book from the author with no requirement that I write a positive review.